This blog post almost started with how excited I was it was Monday and then I remembered nobody ever says stuff like that about Monday! I am still shocked at all the things I was able to actually get done this weekend. Hopefully your weekend was just as productive or maybe even full of fun outdoor activities! 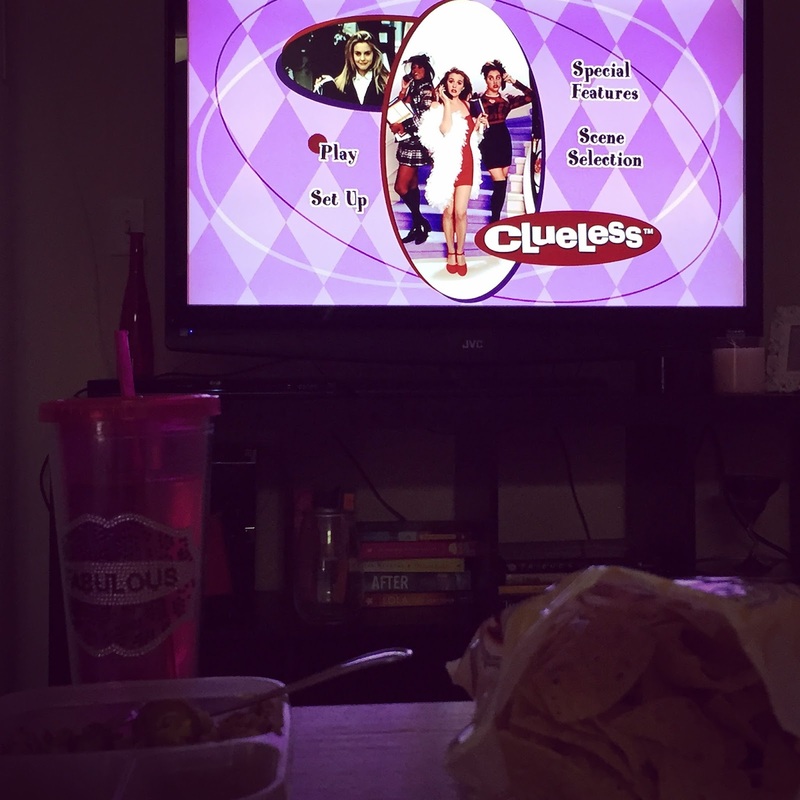 Once I found out that Clueless was turning twenty, thanks Nadine, I knew what I wanted to watch this weekend. It's such a 90's classic and I love reliving it. This was also my first experience with Paul Rudd and I love that man. Saturday morning I didn't let myself dilly dally too much because I had to finish some design work that kept getting pushed back due to other projects. So happy to say that is done and I'm ready to start the next one. You see, after I moved in two months ago, I basically threw everything in the closet that didn't have a place in the rest of the apartment and while that "worked" I hated not being able to walk into my closet. I also had some stuff gathering in the common area that needed to be garage sale'd and the rest needed to find a place in the closet. Here is what my room looks like with the random stuff from my closet not boxed up, etc. This is also why I haven't done a room or apt tour. Do you see how I have nothing on the walls and my bed is missing the frame and the head board. The bed is my goal this month. This is what my closet looks like now that I can walk into it!!! All the excitement, for real. I also purchased all of the things for my Secret Summer Swap pal and I can't wait to mail that off this week!! Does anybody else like doing box swaps?! Sunday night I caught up on blog reading, commenting and responding while finishing this post AND I made my TBR Jar!! Oh and I also enjoyed some ice cream because it was National Ice Cream day. Imagine that, the PERFECT excuse to have ice cream. These are just a couple random funnies I took screen shots of and texted to some peeps. THE PREGNANT LADY isn't funny, she was a promo for the Preggo Expo and last year S and I went to the Bridal Expo so I thought she would get a kick out of a Preggo Expo and I was right, lol. The other one with Ursula was cut off when I screen capped it, I need to find it so I can share it on Fridays! 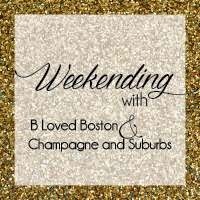 Linking up for weekending with B Loved Boston! Looks like a very productive weekend! Your closet looks fab. clueless was when i fell in love with paul rudd too. he looks the same. to me anyway! haha. i can't believe that movie was 20 years ago!!! You are so funny and cute, just followed you!! I love a good ole productive weekend! I ate ice cream on national ice cream day, a cone in my car on my way home and didn't tell anyone...til now. Lol. Hope your week is off to a great start!! Andrea! You are so sweet! I couldn't reply via email, but I love a good productive weekend too! Hope your week has been great! Love Clueless!! Such a classic movie! Can't believe Clueless was that long ago! Yah for productive weekends! I seriously still cant get over Clueless. When my mom and I were out shopping this weekend, we stopped by DQ for a small treat so I am glad to say I had ice cream this weekend! Yay! Cant pass up national ice cream day. Also, don't feel guilty about having a catch all spot for items that dont have a home. At least you have only been there 2 months. 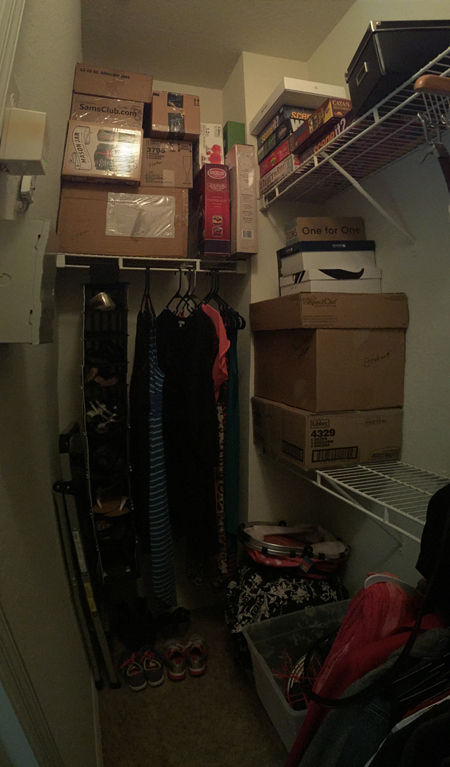 We have lived in our house 3 years and my "office" space is still basically just a storage room. I need to get my life together! 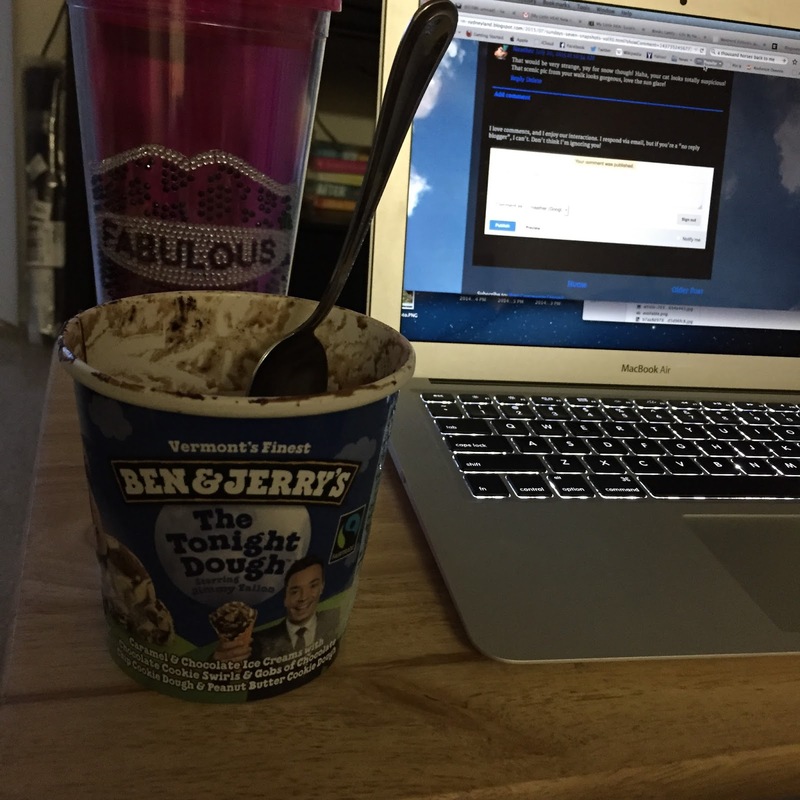 I totally should have had ice cream this weekend, FAIL! I love Tonight Dough, so yummy! I love Paul Rudd too, he's so great! Way to go on getting your closet organized, I love the feeling of getting something organized and clean like that! That ice cream sounds good! I can hardly believe that "Mean Girls" is 11 years old. Holy crap I feel old... Clueless is 20?! WOW! And that ice cream looks amazing, I definitely need to pick some of that up! Very impressed with how much you got done. Wait seriously Clueless is 20 years old???? Damn I feel really old now!